As evidenced in the picture, the light this morning is strangely orange and other-worldly. We had our first frost last night. It's truly Autumnal. 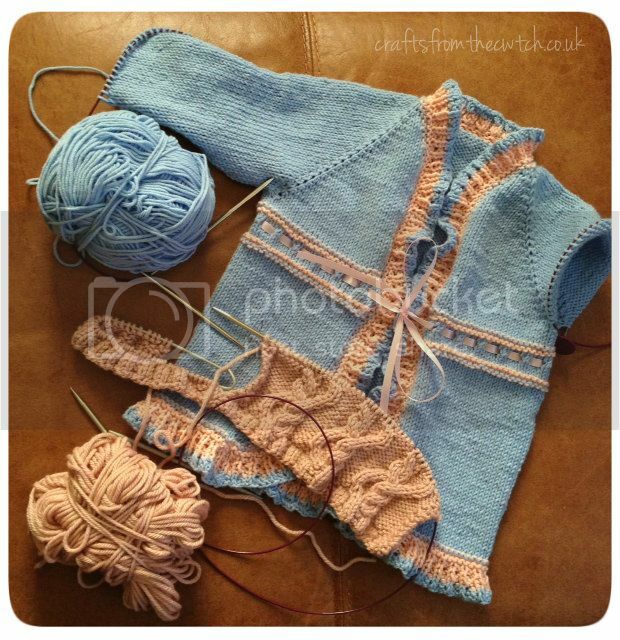 It makes my decision to knit the girl's ballet cardigan before finishing the teapot cosy, the right one. Since Wednesday's update the cardi now has most of one sleeve, all ends sewn in and ribbon threaded through (the latter at Little Miss' request and under her supervision). Ballet class is tomorrow at 4pm so I need to get to it. I love this pattern, and won't be stopping at two - luckily it goes up to teenage size so I can get plenty more out of it. As soon as it's done I'll get back to the cosy/cozy - the ball of cashmerino has suffered some kind of prolapse in my bag, and one thing I can't stand is a messy ball of wool. In other news, My Boy finally made it to karate grading (he missed the last one) and earned his yellow belt. He's very happy about it.....although I still think he looks nicer in red! Today is a day for making use of some of our knits, getting outside and kicking leaves. But first another cuppa. Brrrrr, it doesn't half look chilly out there. View the other posts on Ravelry. I love the ballet wrap, congratulations to your little boy. I love knitted handmade things on children, they look so lovely in them. It doesn't just look chilly out there, I'm pretty sure it is! We are working ourselves up for our weekly wood walk with the dogs, although only in the knowledge that there will be a coal fire later and jacket spuds cooking while we walk. Love the ballet wrap, very cute, it's nice your little girl gets involved in her own fashion choices....your little man looks pleased as punch, clever lad! Love some of the ideas on your previous post, the pin cactus is brilliant! Oh how beautiful! Congratulations to your boy too. It was a beautiful Wiltshire autumn morning here today too - a touch of frost, a touch of mist and beautiful icy blue skies. I did ten miles on the bike this morning and it took the first five for me to be able to feel my fingers. So lovely though! Love the ballet wrap, it looks so pretty! And well done to your little boy, love the number of times he has to wrap the belt around his waist! I hope we get a picture of the little Miss in her new cardi! It's darling! The Saffron is lovely and congratulations to your boy on his yellow belt. He looks very pleased! 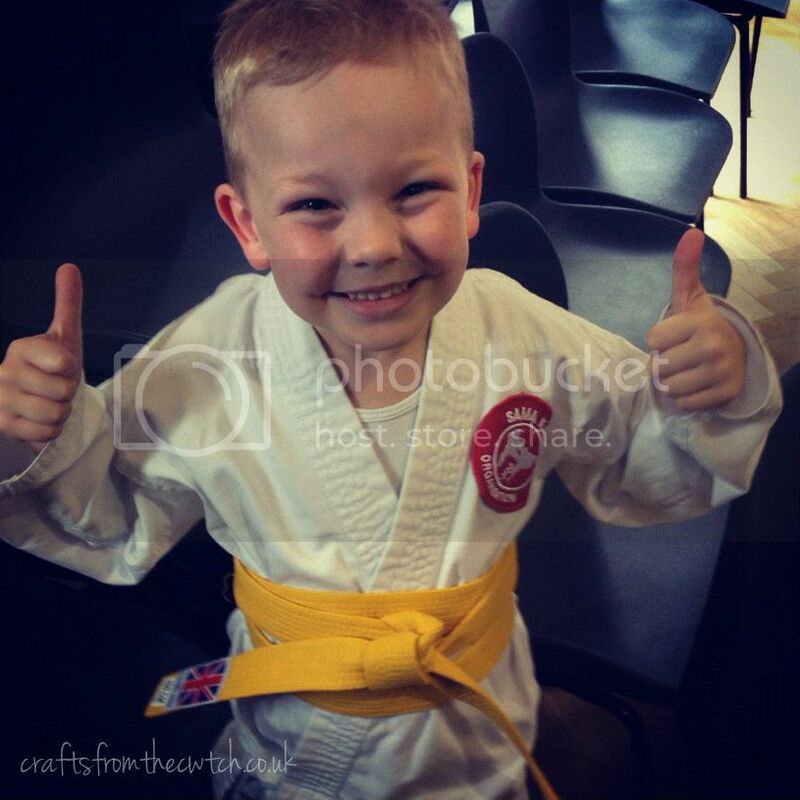 What a darling picture, he's so proud with his yellow belt! Nice projects, particularly love your pretty orange cables. Saffron looks darling; and look you're almost done! I love the ribbon. And if little Miss is supervising then she already loves it. What a sweet little wrap; I made a hat by the same designer, and was so pleased by the pattern-- glad to hear she has consistent quality. This Saffron cardi has so much more character and life than that wrap you were workin' upon previously. It's uplifting to see it. Not so chilly here, but really damp ... I'm feeling the need to knit a waterproof hat so looking for some really woolly wool. hmm..wonder how long that ribbon will last..mine would have it pulled out in a day..! "prolapse ball" LOL..